Waiting For Wednesday opening line: There was no sign of anything wrong. 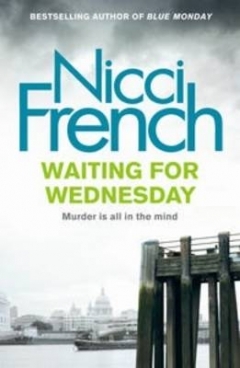 As part of my monthly pick from Penguin, I chose Waiting For Wednesday as the book blurb sounded like it would be interesting. It is a murder mystery and this is the first type of book I choose to read. This is not a book I can recommend. It was so disjointed and I am not sure if this has anything to do with the fact that you have to read the book previous to this, or if it is the writing. It is a murder story set alongside another murder mystery. It involves the police, a psychotherapist and a journalist. The two stories intertwine but it took me longer than usual to read and I could not get into the book. The only reason I finished reading the book was to ensure I could write my review. First published in Great British in 2013 by the Penguin Group. Disclosure: I was sent the book to review by Penguin Books South Africa. I was not required to write a positive review. This post is in line with my blogging policy. Sometimes its good to know what to avoid, Tandy 🙂 I shall give this a wide berth- thanks for the heads-up! I felt compelled to write this review as I hate spending money on bad books! I’ll have to check this out! I am addicted to them! Murder mysteries are tough to keep up with if they are good, when they are bad, you have to wonder why in the world they were published! And it is a best seller! That’s a shame, Tandy. I’m impressed you stuck it out!